Ants and termites do not work well together. This should not be surprising since ants and termites dwell within the same type of environment where they seek the same resources. Many ants and termites, particularly subterranean termites, both nest and forage within soil, so encounters between these two insect groups is frequent in nature. Most of these encounters become violent and do not end well for termites, as many ant species are specialized predators of termites. Some ant species will even march in military-style formations when invading termite nests. Unlike termites, ants possess many predatory physical features, which makes their victory against termites virtually inevitable. Termites are not the only creatures that are troubled by ant pests, as numerous ant species, both native and invasive, are well known for being structural and environmental pests to humans. One group of pest control researchers have managed to eradicate entire ant colonies by poisoning the termites that ants attack. While this method works well at poisoning the individual ants that attack the tainted termites, it is not as clear as to how the poison eradicates entire ant colonies later on. Ant pests are notorious for being difficult to control. Unfortunately, bait poisons that use granules, gels and sprays only affect the particular ant workers that make contact with these bait traps; the rest of the colony, however, continues to thrive. In an effort to spread insecticides within crowded ant nests, researchers coated termites with an insecticide known as fipronil. Worker ants kill these poisoned termites before carrying their corpses back to the colony, as worker ants are not physically capable of consuming termites without help from the ant larvae that live within ant nests. Ant larvae pre-digest the poisoned termites before feeding them to ant workers, which allows the poison to spread throughout the ant colony. The tainted pre-digested termite remains are consumed by the queen, workers, nymphs and all other inhabitants of an ant colony. Although the insecticide used to coat the termites will kill the insects within an hour, aggressive ants typically attack and kill the tainted termites before they die. 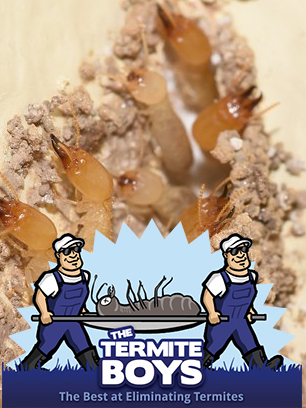 Do you know of any other insect groups that are specialized for feeding on termites?